When I was feeling rundown and full of cold, an invite to a tea masterclass with Dragonfly Tea seemed like the perfect cure! 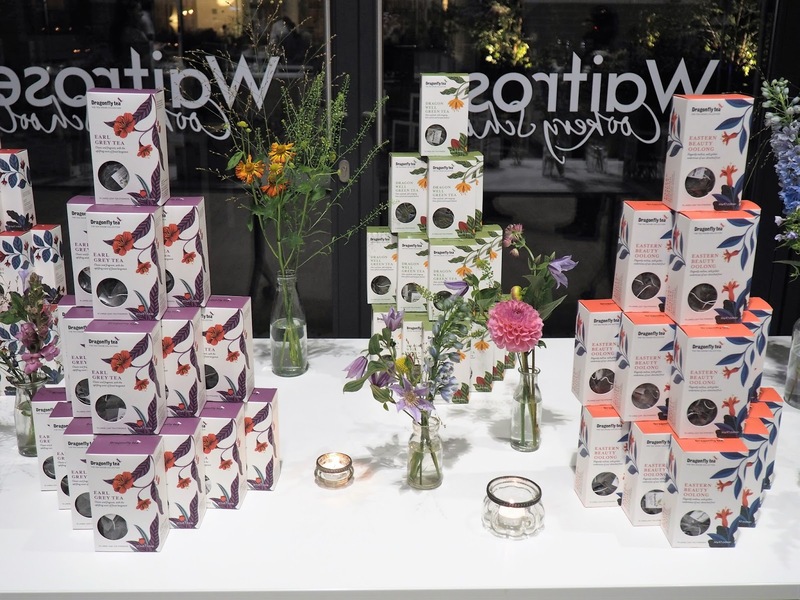 The event was in celebration of Dragonfly Tea's 15th birthday and the launch of their new Tea House collection. 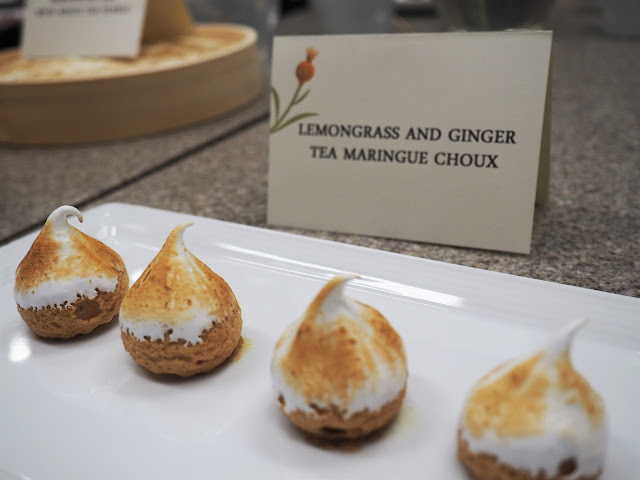 Held at Waitrose Cookery School in King's Cross, we were greeted with tea-themed cocktails and tea infused snacks including green tea and wasabi noodles and lemongrass and ginger tea meringue choux buns! The chefs even let me have a go at blow-torching the meringues and I immediately felt like I was on Great British Bake Off. 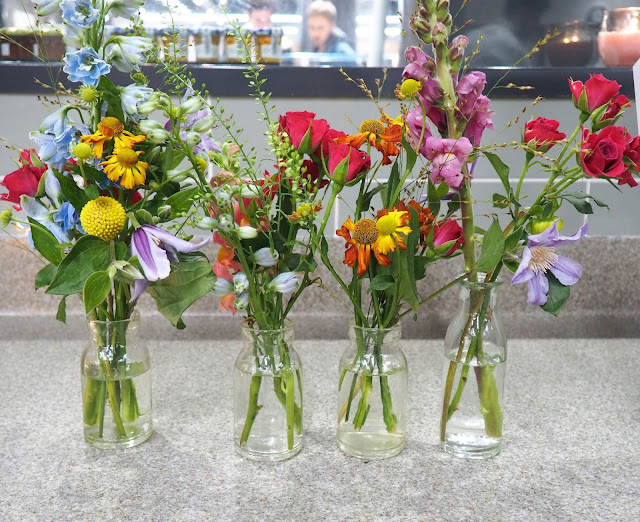 The room was beautifully decorated with flowers, candles and boxes of tea and I immediately started running around snapping up loads of pictures as I couldn't get over how Instagrammable the place was! 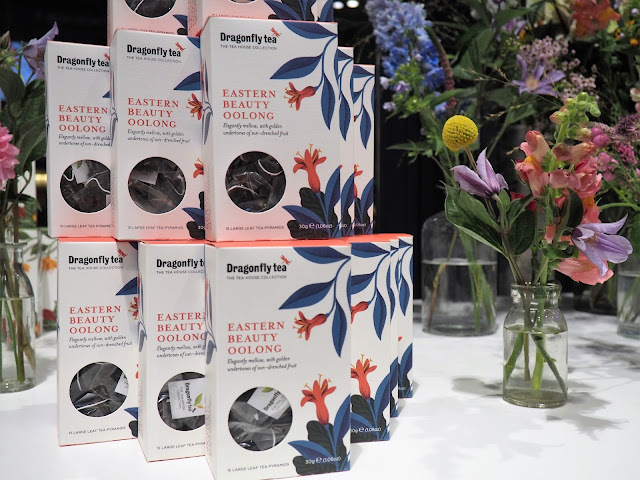 We then had a talk from Georgia Ginsberg, Dragonfly's director, who told us all about the new types of tea from their Tea House range: Dragon Well Green Tea, Eastern Beauty Oolong Tea and Garden Mint and Verbena Infusion. The range celebrates the passion and heritage of Dragonfly, which is a family-run company! 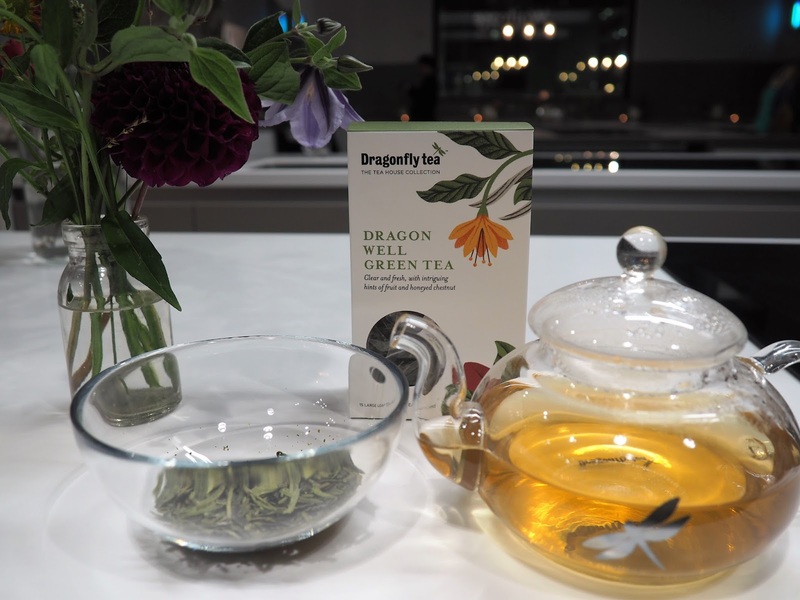 Dragonfly Tea were the first to introduce white tea, chai, honeybush and many green teas to us here in the UK - it was fascinating to here all about their history and passion. Georgia also gave us a few tips on brewing tea - including not to use boiling water on green tea but to let the kettle cool for a while. After sampling some of the different teas and learning the key things to look out for when tasting tea, we then had to put our knowledge to the test in a blind tea test (of which I scored 100%)! 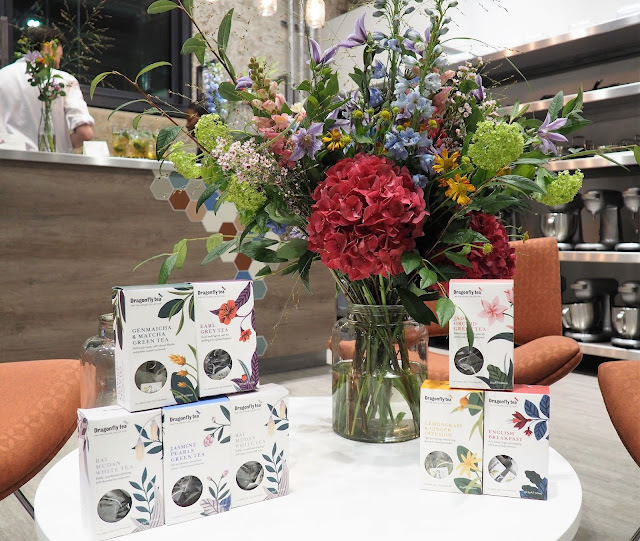 We could then choose two different types of tea to take home with us - I chose Genmaicha & Matcha Green Tea, a savoury tea with a nutty taste, and Eastern Beauty Oolong, a mellow tea with a fruity undertone. We were also very kindly given Dragonfly Tea's brand new luxury scented candle - Explorer's Tea Chest No 1. This is Dragonfly's first ever candle and has been specially made for their 15th anniversary. It smells absolutely amazing and I would recommend it to anyone! You can purchase it as a gift set along with a choice of two teas, which will make the perfect gift for Christmas. 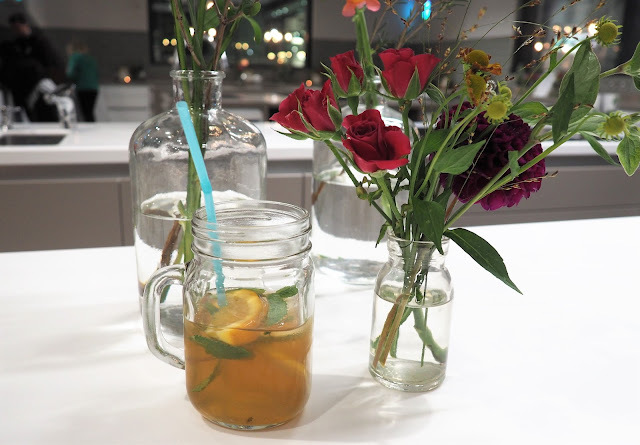 This was probably one of the most fun blogger events I have ever been to because of all the thought put into it! A huge thank you to Dragonfly Tea for inviting me!